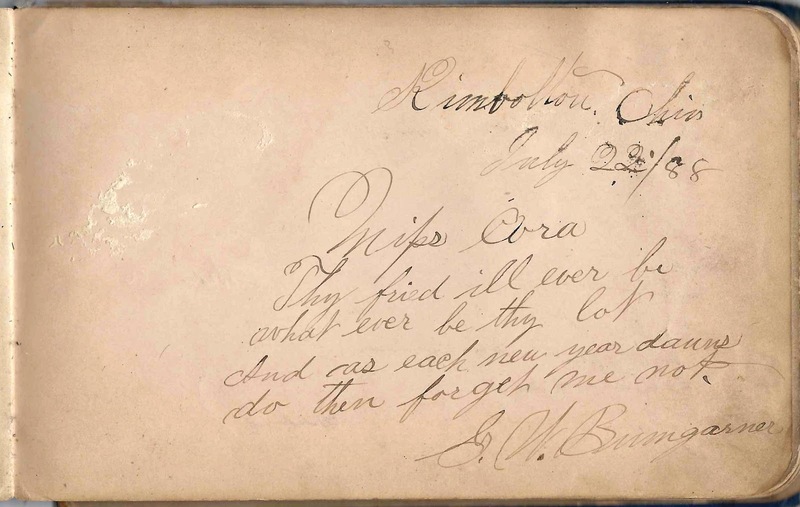 1880s/1890s autograph album that belonged to Cora Miller of Sugartree, Ohio, in Guernsey County. 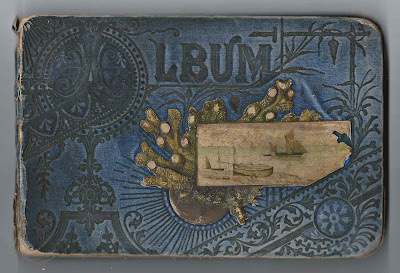 She signed the first page in the album and noted that it was purchased on 28 May 1888. Farther along in the album there's a page written in a fancy script with the name Cora Miller. 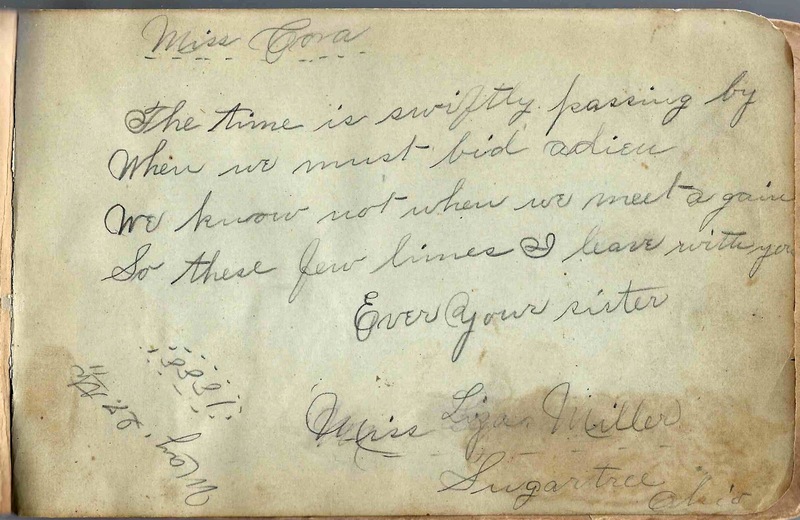 I don't know if Cora penned this page herself or if it was written in her honor. 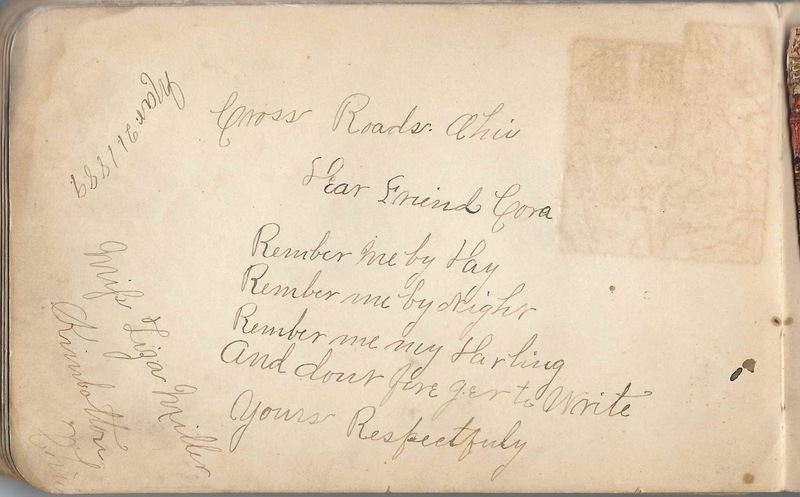 The album is approximately 7-1/2" x 5" and contains the sentiments of 75 of Cora's relatives and friends, some of whom signed more than one page. 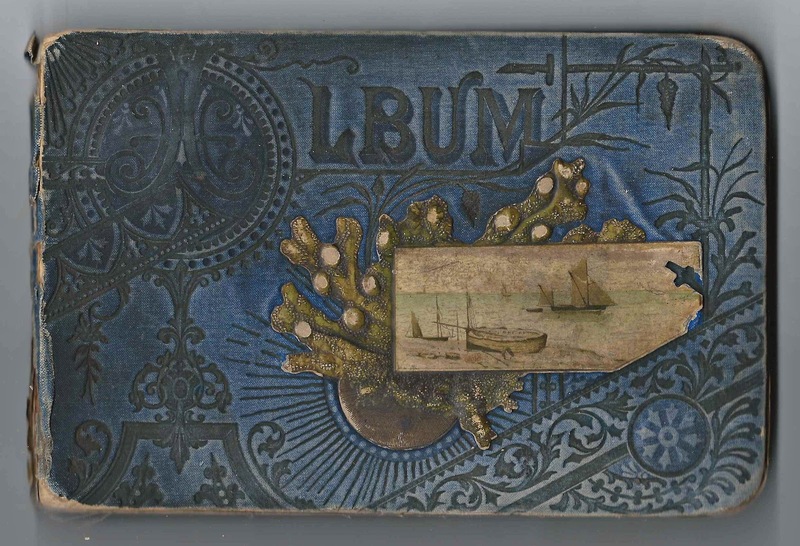 Many pages have wonderful Victorian scraps pasted on them. An alphabetical listing of the signers appears at the end of this post. Cora Miller was born 21 October 1870 in Ohio, the daughter of Mason and Maria Jane (Dawson) Miller. Her father was born in Harrison County, Ohio, and her mother in Newcomerstown, Ohio, in Tuscarawas County. Cora's California death record gives her middle name as Bell. I found an online tree that gave her name as Cora Sarah Miller. 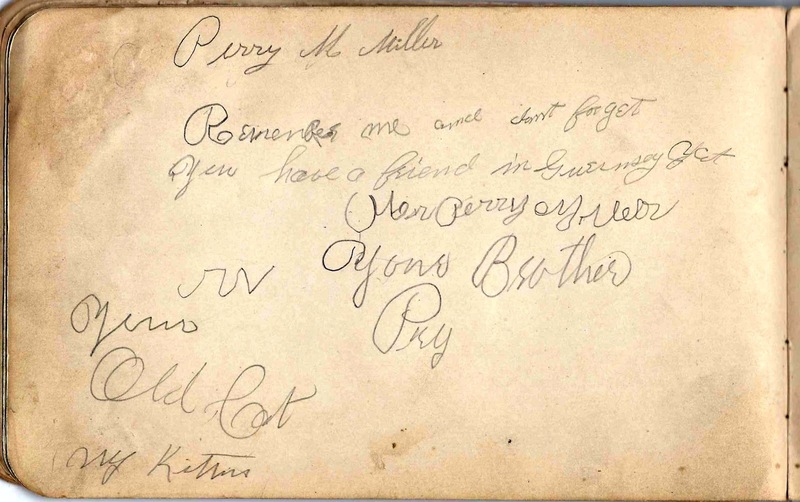 Finding Cora's family was helped by the fact that several of her siblings signed pages in her album; two of them signed more than once. 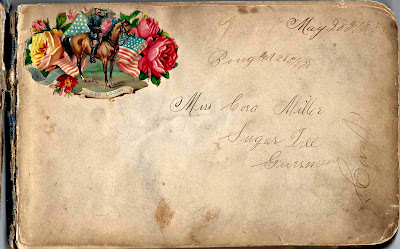 Cora's younger sister Miss Liza Miller of Sugartree, Ohio, signed a page on 28 May 1888, the day Cora bought her album. She also signed facing pages farther on in the album. 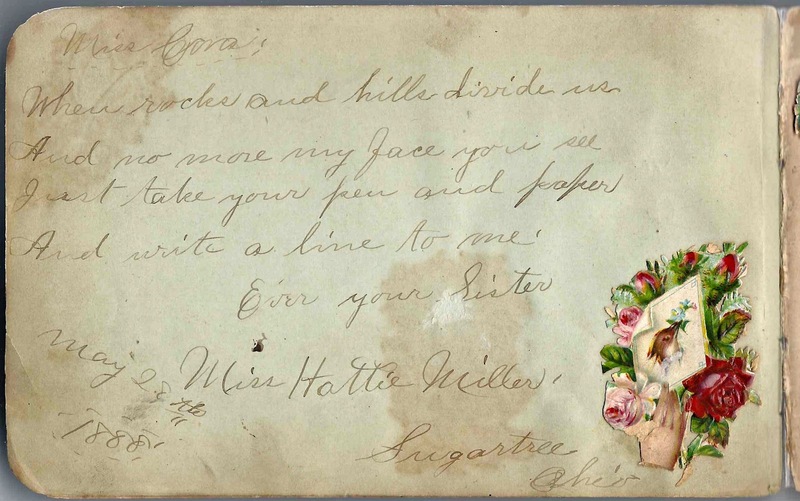 Cora's older sister Miss Hattie Miller of Sugartree, Ohio, also signed a page on 28 May 1888. 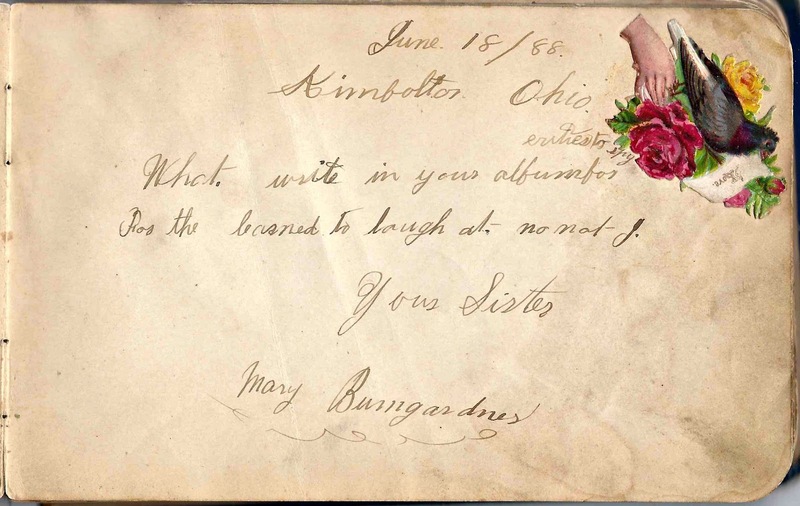 Cora's married older sister Mary (Miller) Bumgardner of Kimbolton, Ohio, signed a page on 18 June 1888. 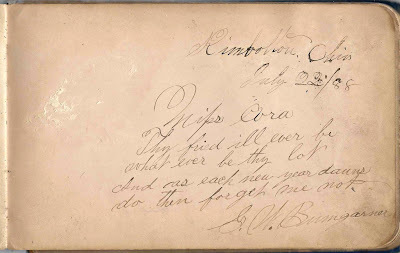 Most records I found for her husband, G. W. Bumgarner, spell his name without the "d", as did he in the pages he signed in Cora's album. 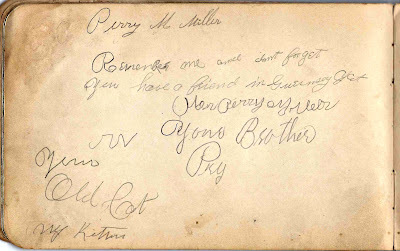 Cora's younger brother Perry Milton Miller signed a page. 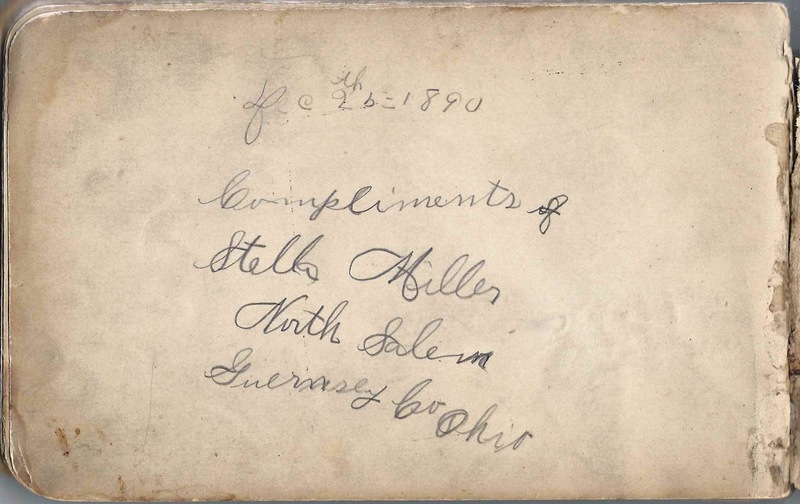 Cora's youngest sister Stella [Estella] of North Salem, Ohio, signed a page on 25 December 1890. On 10 January 1893, Cora married Neal E. Kane. He was born 26 January 1867 in Pennsylvania. They lived in Ohio, Michigan and California, where they died, Cora in 1951, and Neal in 1954. They raised at least three children, two daughters and a son. If you have corrections to the information above, please leave a comment or contact me directly. Thanks! Here's an example of one of the lovely Victorian scraps, on a page originally signed by someone else, but overwritten by Sallie and Betta of Salem, Ohio, on 15 March 1890. Sallie and Betta, signed at Salem, Ohio, on 15 March 1890. There may have been another name under the large Victorian scrap. 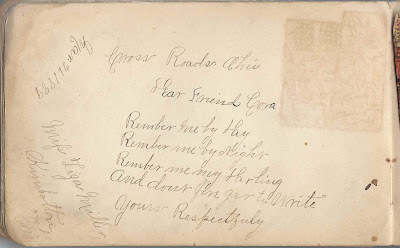 A. M. Beatenhead of Kinbolton, Ohio, signed on 8 September 1889, "S.R.S." The name of the signer from Sugartree, Ohio, is rubbed out. The date signed was January 1889. 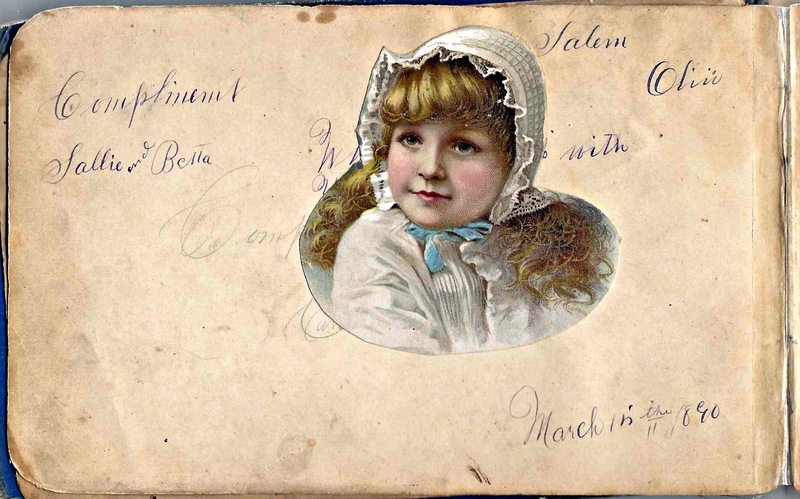 The page has the names of Jennie Julia Sallie Bethard Hawes. Perhaps it means Jennie and Sallie Bethard and Julia Bethard Hawes. Harry C. Beymer, siged at Washington, Ohio, in January 1889. 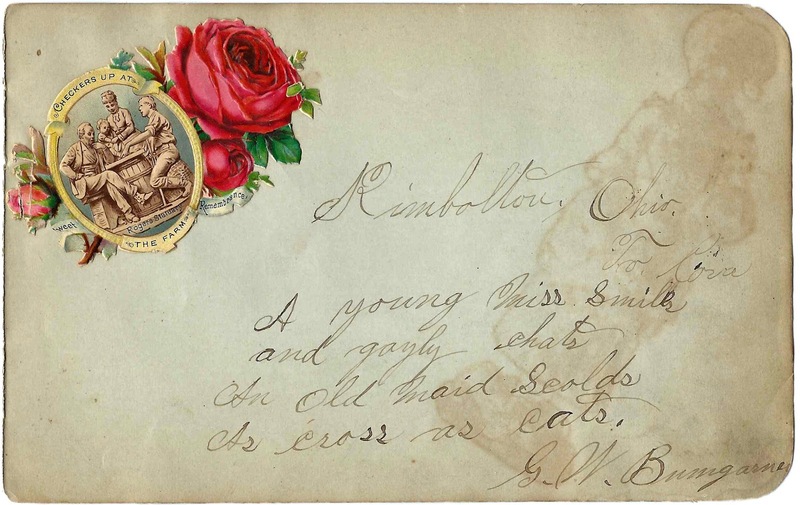 Mary Bumgardner, signed at Kimbolton, Ohio, on 18 June 1888; Cora's sister. Mary spells her name a Bumgardner, but her husband, who signed two pages, leaves out the "d"
G. W. Bumgarner, signed at Kimbolton, Ohio. 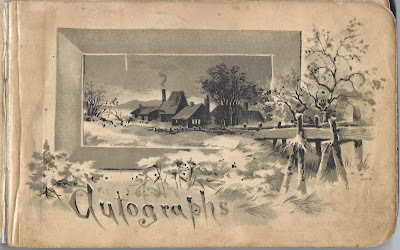 He signed another page in 1888. Esther Fields, wrote in a childlike script; shared page with M. C. Mc. or M. E. Mc. The page has two names: Lizzie Henderson and Mary L. Henderson. Two separate people or just one? 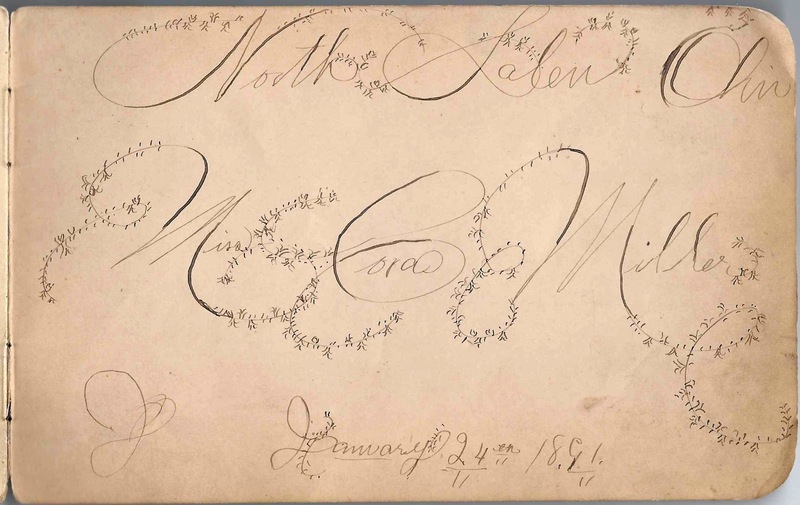 J. P. Lanning of Odell, Ohio, in Guernsey County, signed on 25 January 1892; signed two pages, the other in 1891. 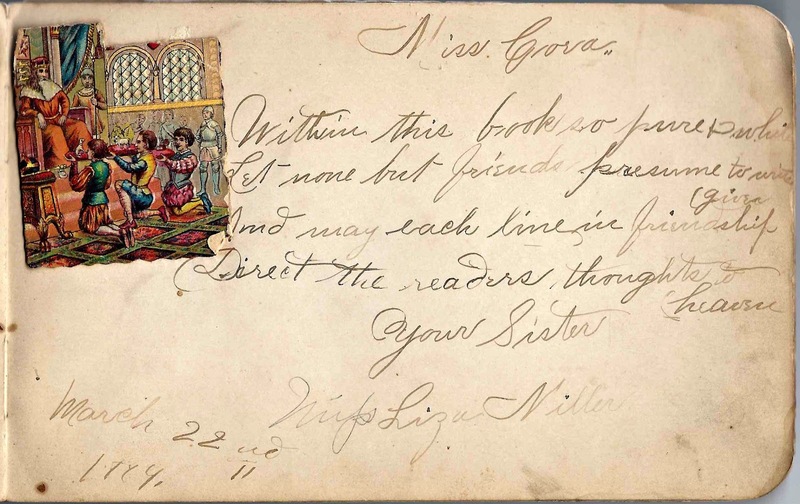 Miss Liza Miller of Sugartree, Ohio, signed on 27 May 1888; Cora's sister. She signed two facing pages farther along in the album. 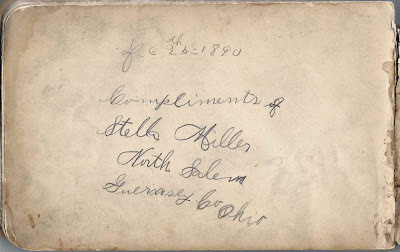 Name on the page is Miss Cora Miller, signed at North Salem, Ohio, on 24 January 1891. Was she the album owner or someone with the same name? The page is more than halfway through the album. Cora's brother Perry M. Miller. 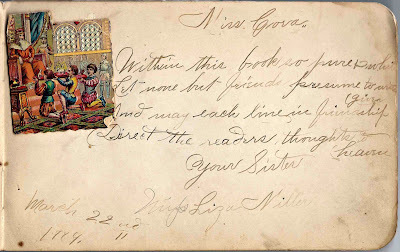 Mary Miller, signed on 26 August 1889; not Cora's sister, as she would have been married by then, and the message doesn't sound as though it came from Cora's mother. 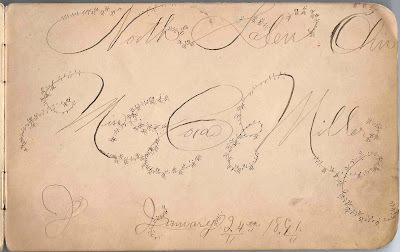 Lemuel R. Shaffer, signed at Homestead, Pennsylvania. There's other handwriting on the page that mentions Bradford, Pennsylvania, Olean in Catagaugus County, Pennsylvania, Portland, Oregon, Oil City, Pennsylvania, East Sandy, Pennsylvania. It also mentions Cora Miller of Sugartree, Ohio. At the bottom is the date of 18 November 1888.